A seasoned attending’s advice on maintaining physical wellness. It was the end of another long day in the clinic, and I had one final laser panretinal photocoagulation to perform. As I placed the indirect laser on my head and brought up my 28-D lens, I came to the unfortunate realization that my neck was absolutely killing me. Now that we’re in the OR every day, we depend even more on our bodies to perform well for us physically. The concerns of retina fellows are numerous; we want to improve our clinical care, develop our operative skills, and continue research projects, all while trying to maintain a life outside of fellowship. With all this going on, we rarely stop to consider our own physical well-being. As young physicians, one thing we have going for us is that most of us do not have chronic ailments or pain. However, vitreoretinal surgery can be demanding on the body. If we want to maintain a long career and avoid such chronic ailments and pain, we must address these physical demands early on. The physical demands of our subspecialty come at every turn. In the clinic, indirect ophthalmoscopic examination, prolonged by scleral depression or laser, can fatigue the neck and shoulders, while slit-lamp examination with improper alignment can stress the back. Most demanding of all, the OR requires surgeons to align themselves with a microscope, the patient bed, and numerous instruments. For fellows, these demands are often intensified because of high repetition and because we often use the assistant scope, on which we may not be able to control the microscope height or precise positioning. Because the pedals for the microscope, vitrector, and laser are arranged for the primary surgeon’s use, the assistant’s chair is often far from the side scope, which requires the assistant surgeon to maintain a leaning position, causing stress on the lower back and shoulders. 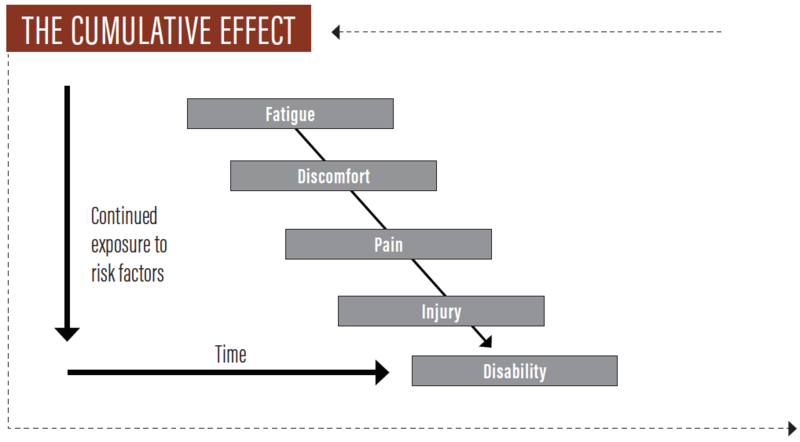 The effect of continued exposure to these physical stresses increases over time (see The Cumulative Effect). Musculoskeletal injuries are common among ophthalmologists: 46% of respondents to an American Academy of Ophthalmology (AAO) physician survey reported neck pain. Back pain was even more common; up to 54% of respondents reported symptoms.1 Further, 15% of respondents reported that musculoskeletal injuries have resulted in work limitations. In addition to physical pain, occupational injuries can lead to significant financial loss, with temporary and sometimes permanent disability. Luckily, back and neck pain are often preventable. I sat down with Sunir J. Garg, MD, FACS, one of the retina attendings at Wills Eye Hospital, to discuss modifications to our clinical practice and lifestyle that we can incorporate to avoid pain and prolong our careers. 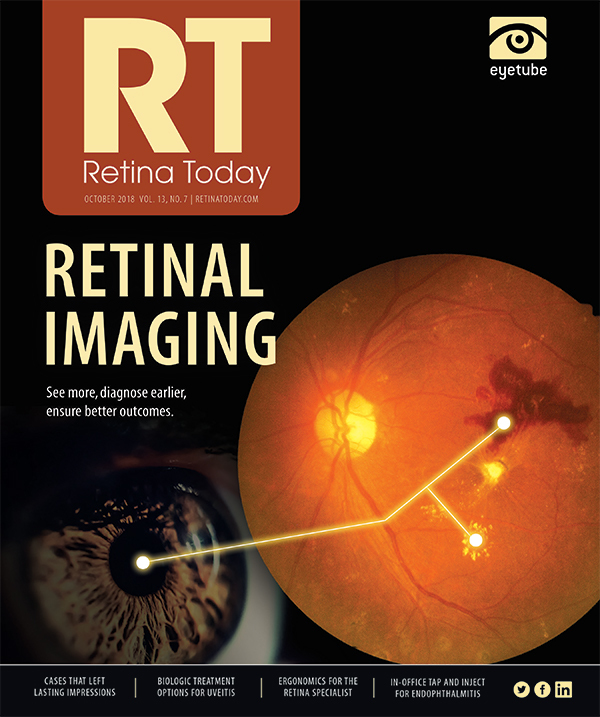 Retina Today: When did ergonomics become important to you? Sunir J. Garg, MD, FACS: During my second year of residency, we started spending a decent amount of time in the OR. I found that, by the end of a typical OR day, my back was nonfunctional. Being in the OR every day was really killing me, to the point that I was considering going into neuroophthalmology. (It was that bad.) Around that time, my neighbor asked me how things were going with work, and I told her about my back woes. She suggested that I take yoga classes, specifically Iyengar yoga. I took her advice, and it made a huge difference. Iyengar yoga emphasizes alignment and postural awareness. The retina specialist personality fits in perfectly with this type of yoga. Within a week or 2, my pain had totally resolved, and my strength and flexibility had improved. The word yoga comes from the same root as “yoke”; yoga is meant to link the body and mind. In the West, most of the emphasis in yoga is on its physical aspects, which are really helpful, but increasing awareness of your body and its relationship to the environment around you has been just as important to me, if not more so. I became aware of my spine and body alignment. Yoga played a critical role in my fellowship, when I operated 5 to 7 days a week for a year. Even now, I have to do yoga a couple of times per week to stay functional. RT: What are the most common mistakes made by fellows? Dr. Garg: Fellows frequently sit with poor alignment in the OR. At the start of a case, I often see fellows positioned too far away from the patient, sticking their backsides out in the chair and bending forward at the lower back with their necks craning forward to reach the scope. Poor positioning will lead to a strained back, hunched shoulders, and a cervical spine crunch. Generally, I don’t use the wrist rest. This allows me to come even closer to the patient and avoid leaning over. I try to have the patient’s head touch my xiphoid process. I encourage fellows to sit in the OR chair with their feet on the pedals, swing the scope into a position that works for them, and then bring the patient and the patient’s eye into view (without adjusting the scope or chair). This process has to be done only a couple of times before you get the point. It’s a useful exercise. Just tell the attending what you are doing, lest they sign you up for mental health classes first. RT: What changes have you personally made in the clinic and OR? Dr. Garg: In clinic, I try to keep my spine upright and neutral at the slit lamp. I set my chair and the slit lamp at a position that is comfortable for me and move the patient’s chair up or down to work with my settings. Although I always try to keep the patient comfortable during the examination, I’ve come to realize that the patient has just a short time at the slit lamp—often just a couple of minutes—while I perform the same repetitive movements 60-plus times a day. Outside of the clinic or OR, colleagues have found numerous approaches that are helpful, especially core strengthening, Pilates, yoga, massages, and the services of a good chiropractor. I recommend that fellows pay attention to their bodies and find the exercise routine that works best for them so that they can maintain long and successful careers. 1. Dhimitri KC, McGwin G Jr, McNeal SF, et al. Symptoms of musculoskeletal disorders in ophthalmologists. Am J Ophthalmol. 2005;139(1):179-181.